The History of Rhodesian ridgebacks in Latvia is quite recent. 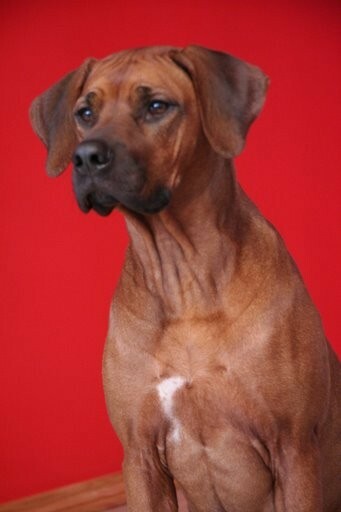 The first ridgeback in Latvia was Arriba-Riba-Riba „Riva” (Bryaba Top Gun x Windriver Bryaba Sassy Lassy), owner I. Cerbule. Riva was imported in 1994 from USA – she was born on 25 February 1990, holder of several AKC titles and successfully participated in shows in Latvia. Riva had one litter in USA, but had no litters in Latvia. 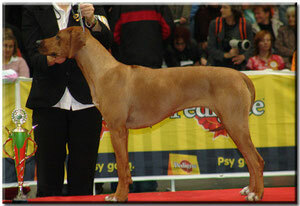 The second ridgeback was imported to Latvia in 1999 – Ceis Exotic from Russia, owner I.Kantmane. 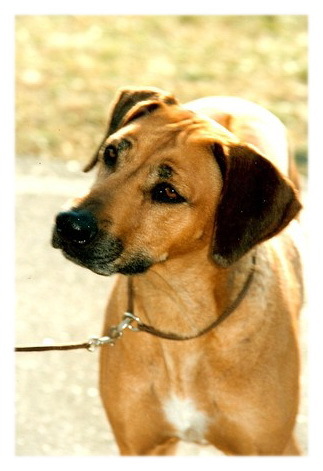 The third Rhodesian ridgeback was imported from Russia in 2002 – our mum Sindi (Ezop x Izolda), owner M.Grinvalde. Some evidence can be found about other ridgebacks imported to Latvia in this time period; however only limited amount of information is available about them.To a large extent it is because several of them did not participate in shows and/or did not register in any of clubs. From 2006 till 2011 several ridgebacks were imported from Russia, Czech Republic, Slovakia, Sweden and other countries. So far 13 RR litters have been in Latvia. 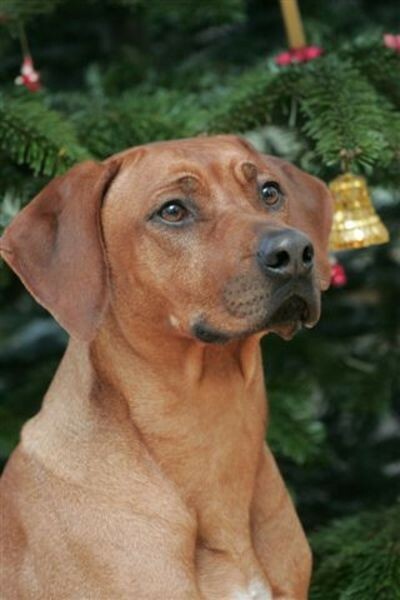 In December 2004 the first Rhodesian ridgeback litter whelped in Latvia: Pleasant View Bestik x Sindi. In litter eight puppies were born, of which in Latvia stayed five females and one male. Also the second and third litters born in Latvia were from Sindi: in February 2006 with sire Ye Japha Ben Shemen of Vizara x Sindi (in litter five puppies were born, of which in Latvia stayed one female) and in August 2007 with sire Shangani Umvutcha Lonzo (in litter seven puppies were born).The fourth litter in Latvia was between A Ray of Light Nyathi x MaloziHabiba. 12 puppies were born, of which in Latvia stayed 6 females and 3 males. Important contribution towards development of breed in Latvia has been given by Marina Grinvalde, who raises first two ridgeback litters. Puppies from these two litters are multiple winners and are well known also beyond borders of Latvia. Important input towards recognition of the breed has been given by KristīneLiberta, thanks to whom general public has been introduced to this breed through various publications in local media. MaloziHabiba, owned by KristīneLiberta, has left her footprint in RR world history – she was Best in Show, Junior World Winner 2006 (World Dog Show 2006, Poznan). In order to receive permission for breeding, a ridgeback shall receive at least two evaluations „excellent”, one of those may be received in junior class and at least one assessment shall be received in a Specialised show of Dalmatians and Hound Breeds club. hips – A, B, C; elbows – 0, 1; eyes – clear. Currently there are no specific temperament tests for Rhodesian ridgebacks. Any show participant should follow the LCF Code of Ethics, adopted in September 2006. 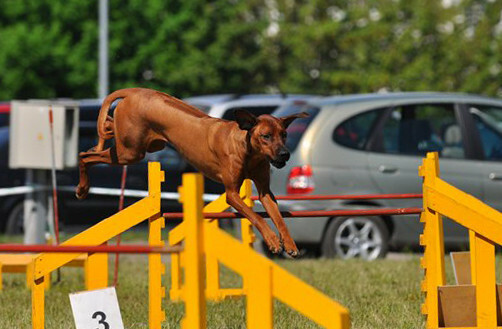 Owners of Rhodesian ridgebacks can engage in different activities. The most popular are agility and obedience disciplines, while lure coursing, search and rescue, and field tracking trainings are available. In the lure coursing, Rhodesian ridgebacks are the only ones from FCI VI group, which can receive coursing licenses and further participate in shows also within a working class. Lately coursing is becoming increasingly popular. In Latvia Rhodesian ridgebacks can be used in hunting, however this activity has not became popular among owners or RRs. If compared to other breeds, very few ridgebacks participate in hunting. For now, the most active ridgebackin Latvia is Aresvuma Jeron Jango „Rodger” (date of birth 28.07.2007, imported from Russia), owner N.Loginova. Rodger has successfully participated in many agility and obedience competitions. 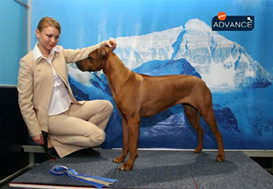 Rhodesian ridgebacks in Latvia can participate in international CACIB shows and national CAC shows. As there is no specialised Rhodesian ridgebacks club, specialised shows are held within FCI VI group shows. Specialised FCI VI group shows are held three times per year.